This is an all time favorite preparation in Western India. Many people find it difficult to make. Sometimes it becomes soggy, sometimes it is dry. You need to keep stirring it regularly to avoid forming lumps. You need to add more ghee (clarified butter) to avoid it sticking to the pan. To overcome all these problems, check this recipe where I make it in microwave. It just needs 1 teaspoon of ghee and Khichadi comes out with nice texture. No problem of sticking khichadi to the pan. Try this method; you will like it. 1. 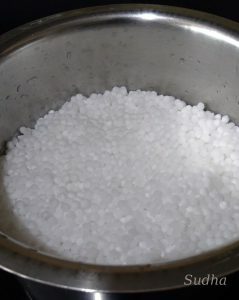 Wash Sabudana and soak in water for 6 hours. Use just enough water in the bowl to cover Sabudana. This is an important step in this recipe. If water is too much, Khichadi will be soggy and will have lumps. If water is less, Khichadi will be dry. 2. Since the soaked sabudana will be lumpy, loosen it by hand. 3. 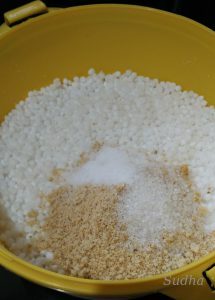 Mix roasted peanut powder, Salt and Sugar with sabudana. 4. 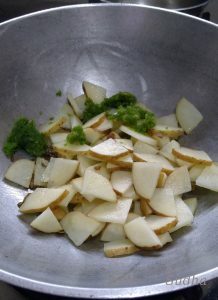 Wash potato, chop it into medium pieces. I don’t peel potatoes; If you want, you can peel and then chop. 5. In a small pan, heat ½ teaspoon of pure ghee on medium flame. 6. Add Cumin Seeds, wait till sputters. 7. Add green chilly paste and potato pieces. 8. Cook covered on low flame; stirring after every 2 minutes. 9. Mix Sabudana mixture along with cooked potato in a microwave safe bowl with lid. 10. Cook covered in microwave on high for 2 minutes, take the bowl out of microwave; stir the mixture. 11. Cook covered for about 6 minutes or till Sabudana is uniformly transparent and soft. Stop the microwave and stir, every 1 minute to avoid formation of lumps. 13. When cooked, add fresh scraped coconut, chopped coriander, lemon juice and ½ teaspoons of pure ghee and mix well. 14. cook in microwave for 1 minute. 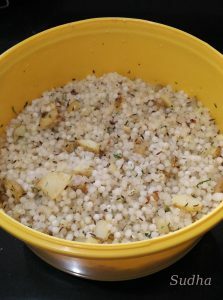 Khichadi is now ready. 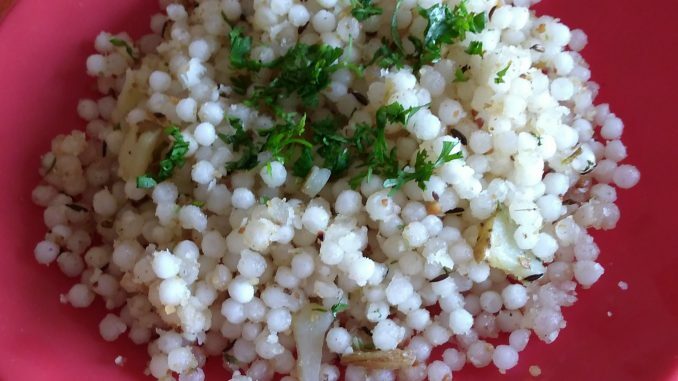 In Konkan, Khichadi is also served with Curd. If you don’t have microwave, you can use a Wok / Deep Frying Pan. You will require more ghee if you cook this way. After cooking for about 4 minutes in covered Wok, cook without the lid till Sabudana is transparent. Keep stirring regularly to avoid lumps. Thank you Sagar. please try this and let me know.